I question whether these two pieces really go together. 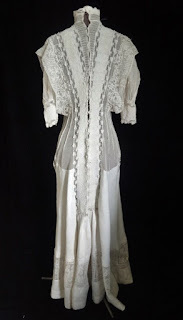 The blouse is classic teen's era but the slip dress is pretty short looking - more in keeping with the later 1920's. 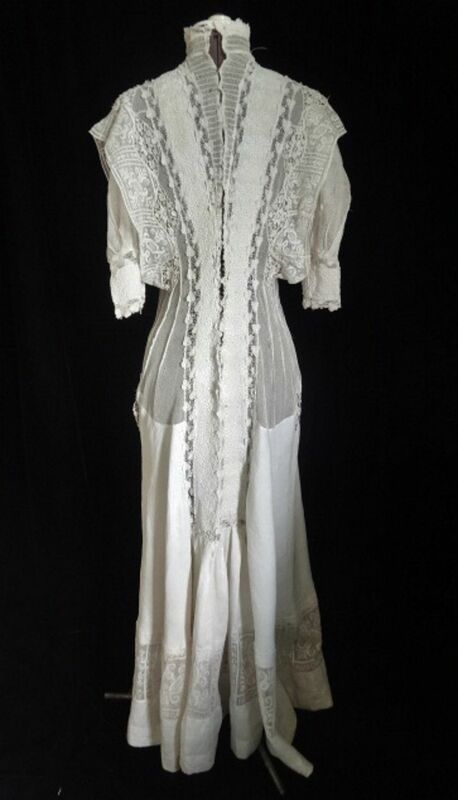 However, since the seller didn't give measurements, I'm going to compromise and say 1919. 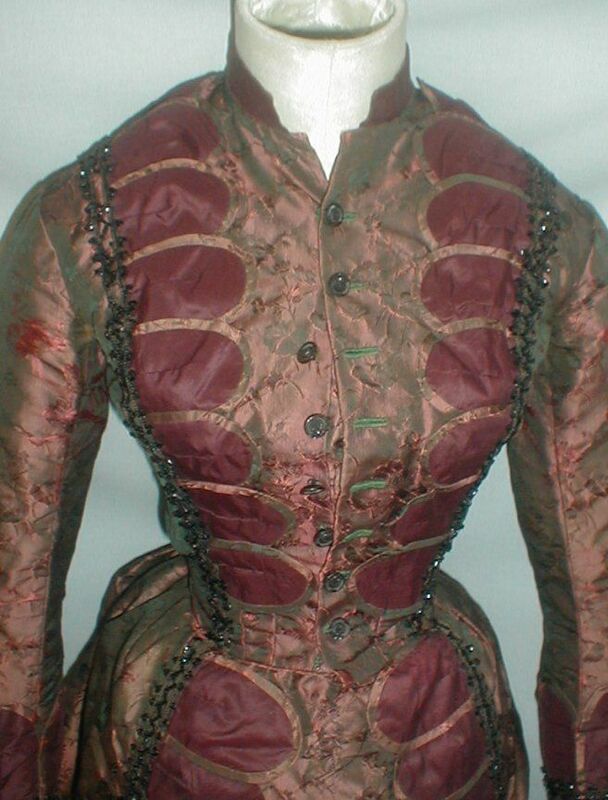 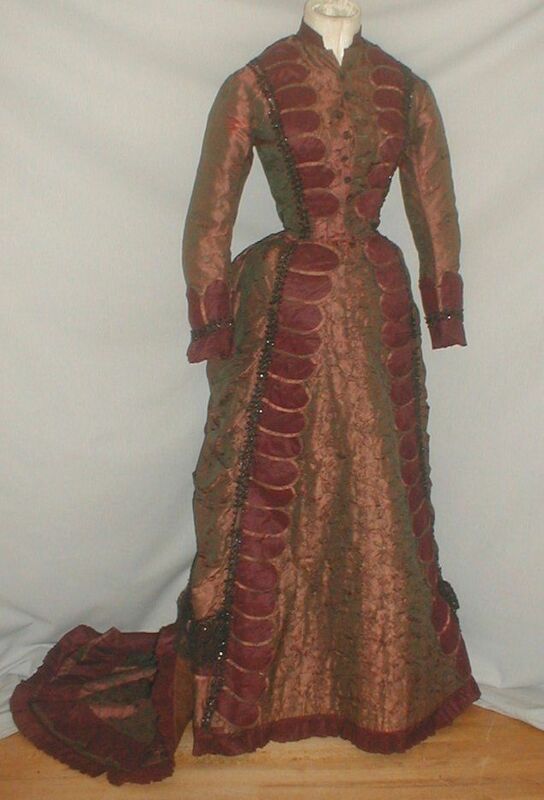 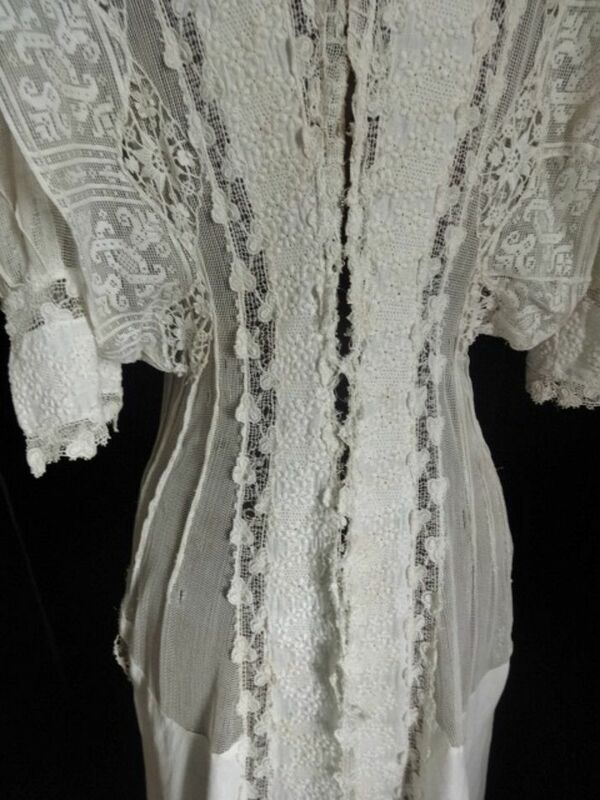 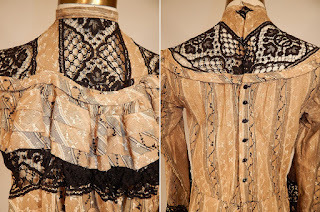 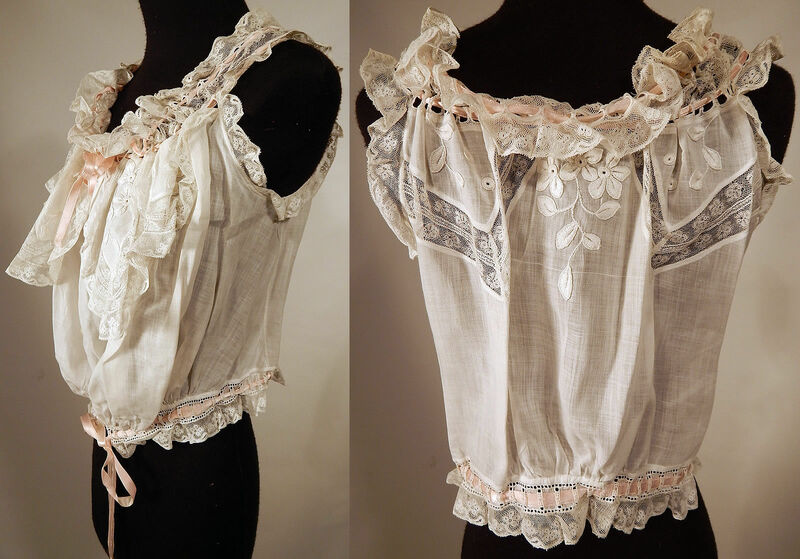 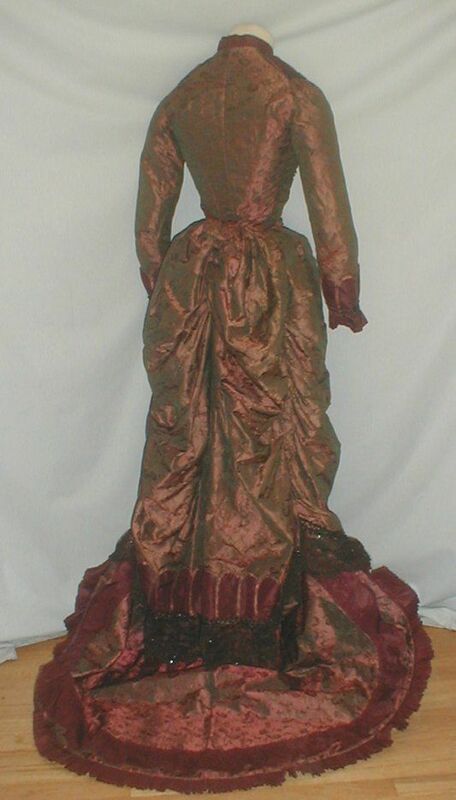 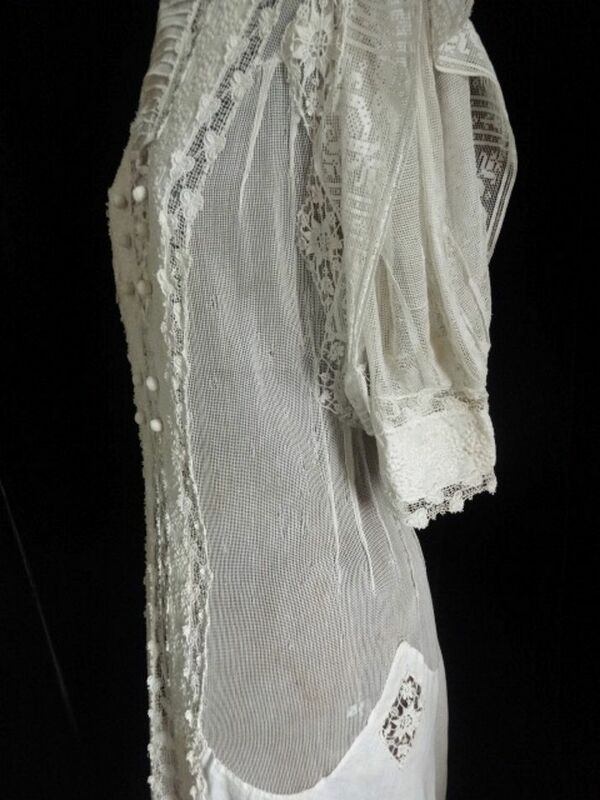 This is a vintage dress dating from about 1909. I found one very much like it in an old catalog from 1909. 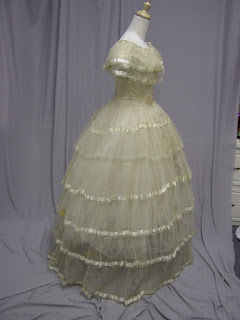 It was advertised as being a wedding or a party dress. 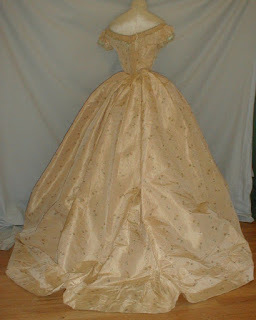 The dress is a light ivory color. 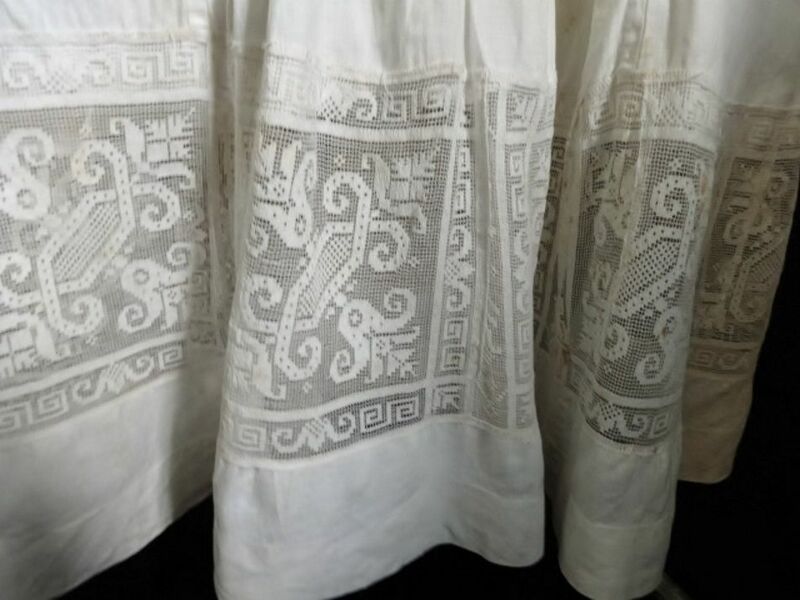 The fabric looks and feels like a very fine linen. 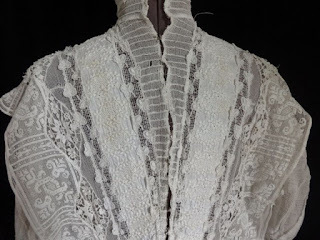 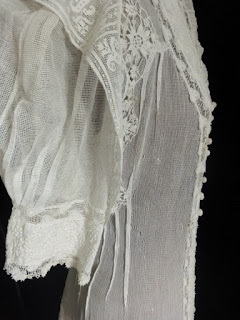 There are large net inserts and multiple kinds of lace. 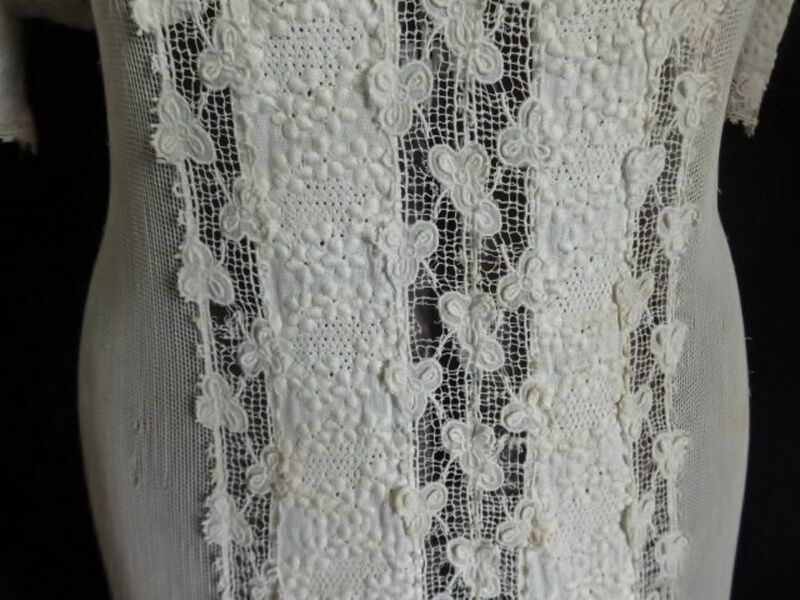 The net sleeves are short and puffy with embroidred bands. 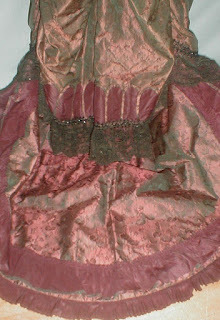 The bottom of the dress flares so it is quite full at the bottom. 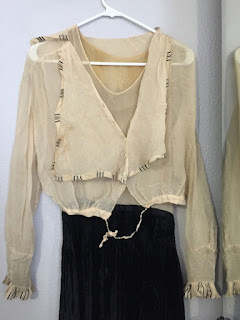 There are some repairs. 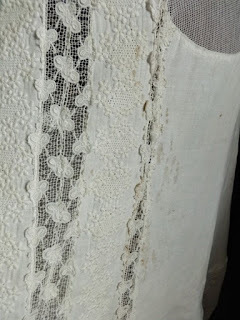 Some are old repairs and some appear to be newer. 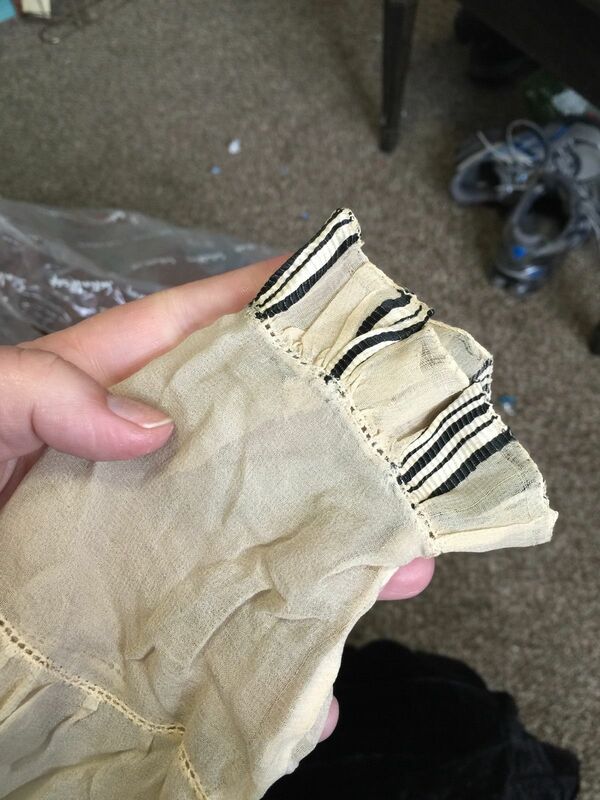 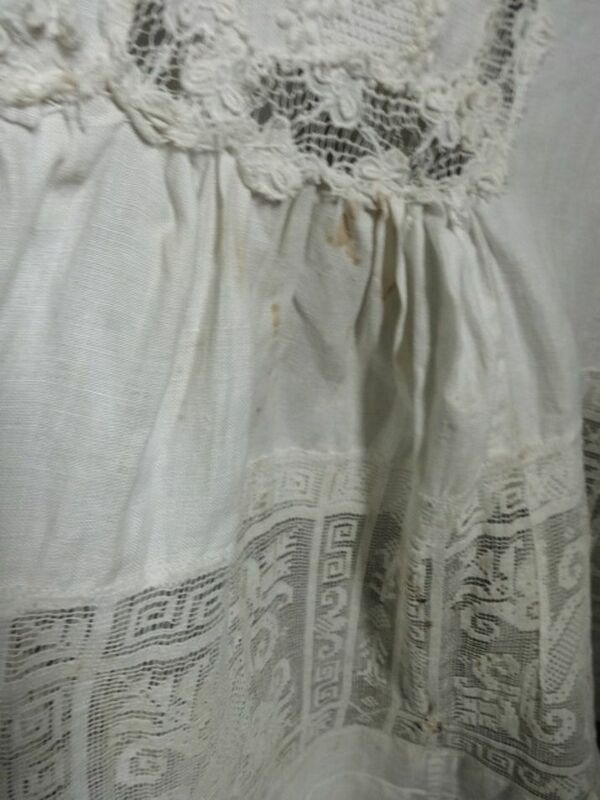 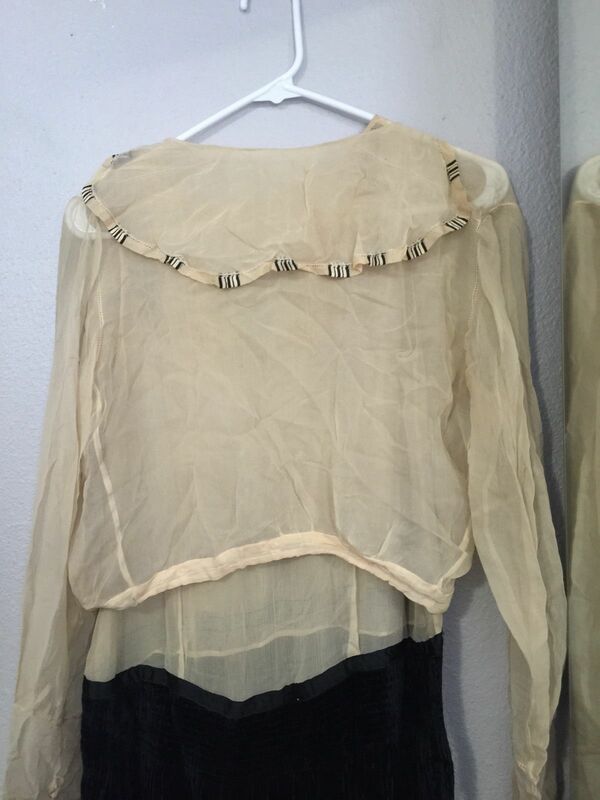 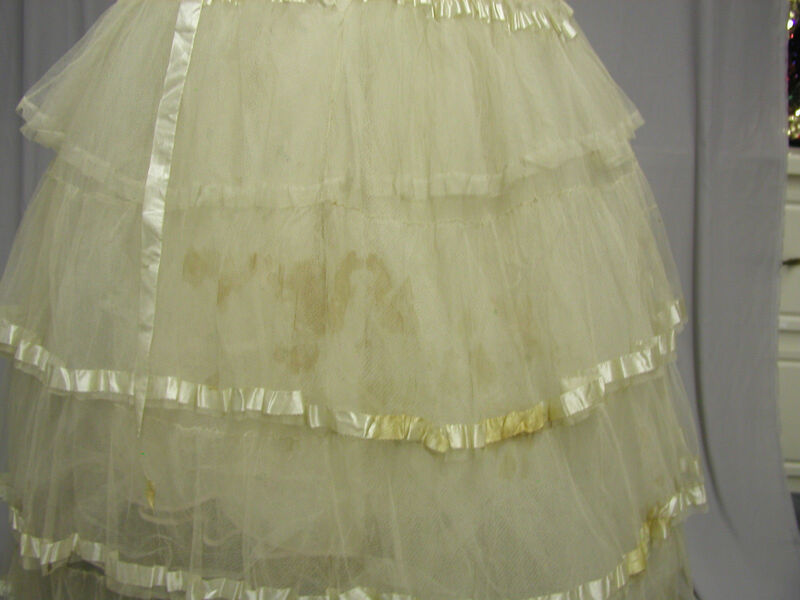 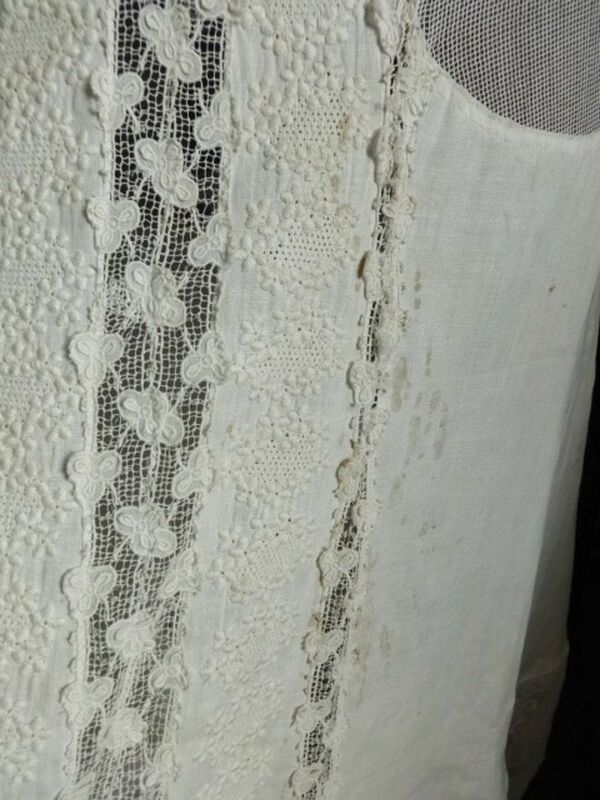 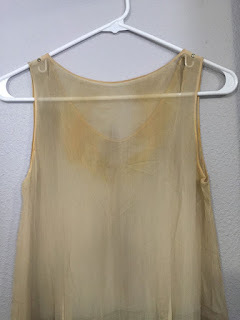 There are some light rust stains and a few holes in the lace and net. 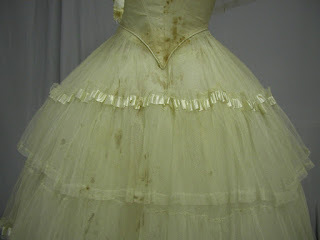 I have tried to provide plenty of photos to show the condition. Hooks-and-eyes run down the center back. 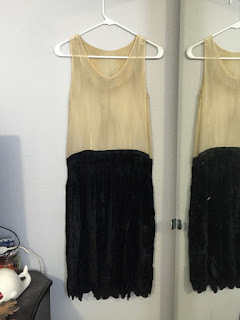 The neck was too small for my dress form so I pinned the neck in place. 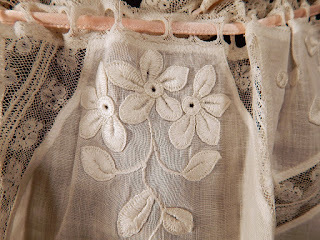 A few of the hooks will need to be replaced. 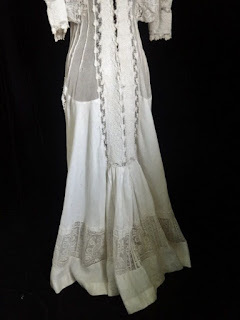 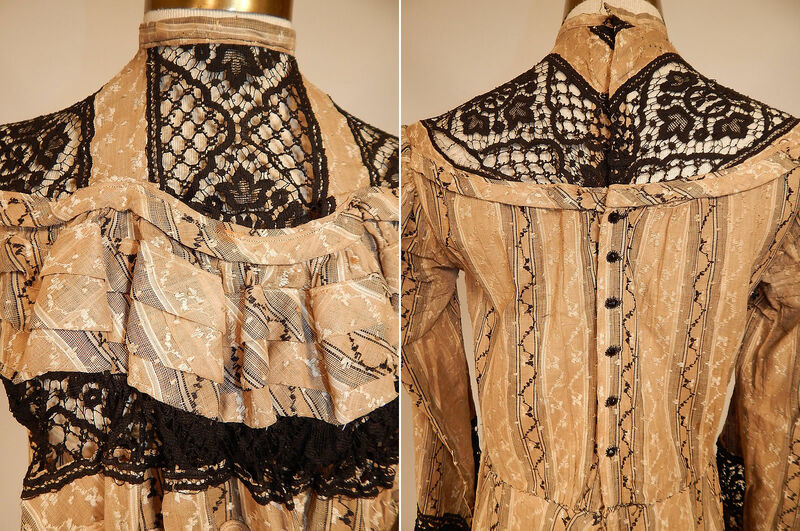 This is a really beautiful example of Edwardian dresses. 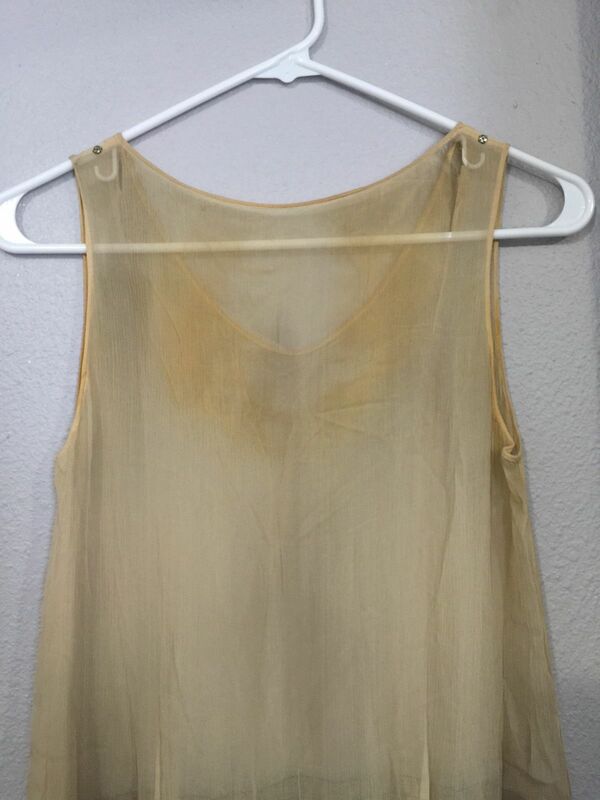 It's actually from a bit earlier. 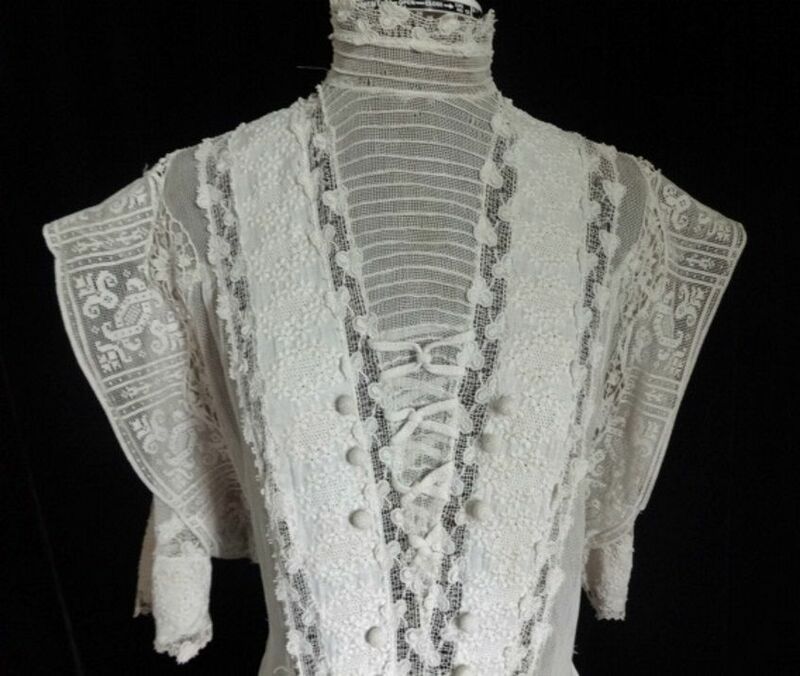 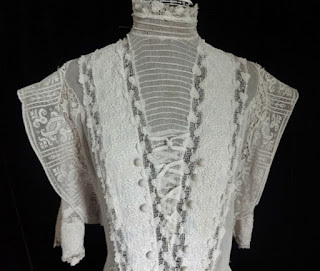 As you can see, it doesn't have that high waistline or lowered neckline or fitted sleeve or anything really we associate with the later "Titanic" styles - which it should have some elements of if it was from 1909. 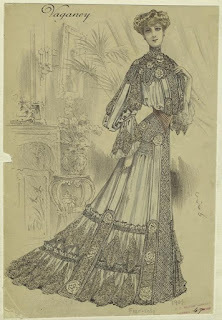 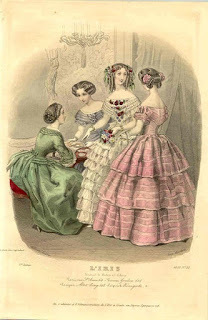 Below is a fashion plate from 1904. 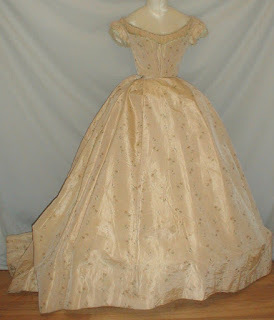 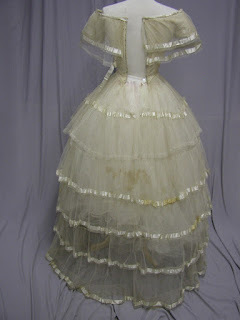 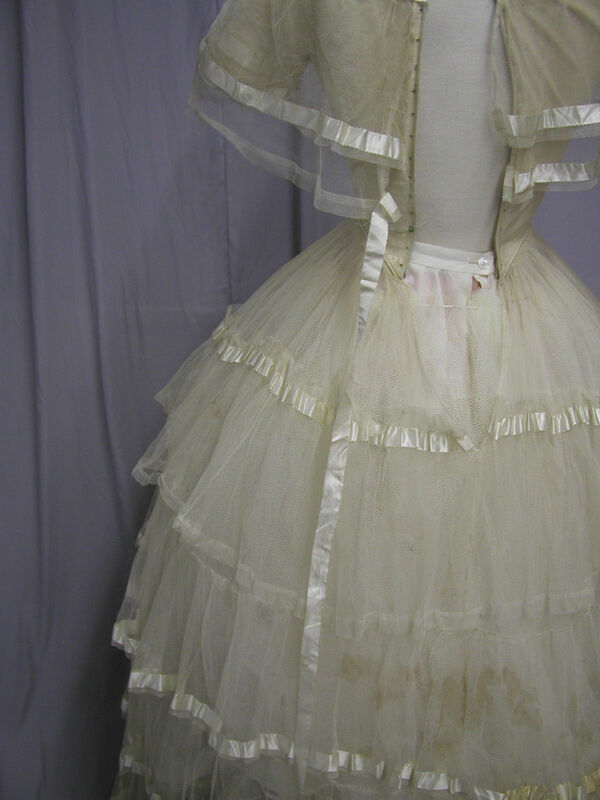 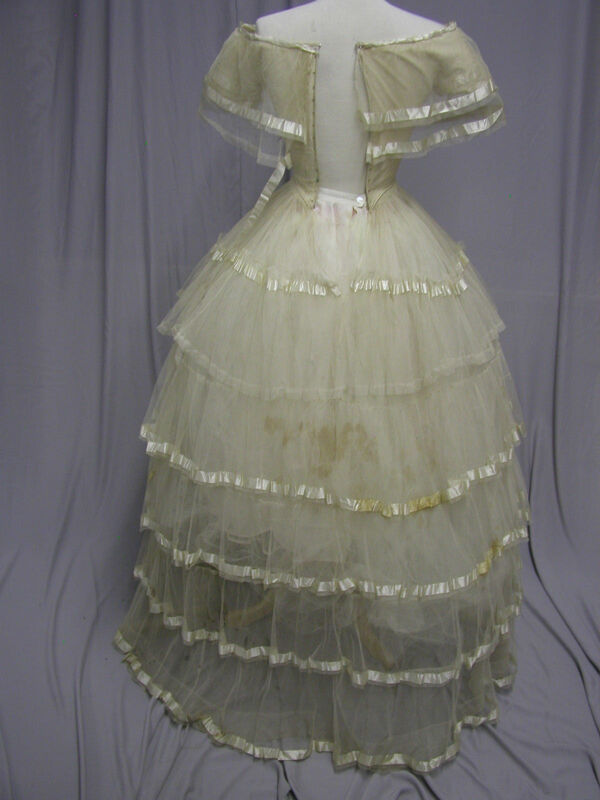 Enchanting 1850's Ballgown of Silk Tulle & Ribbon: This once was a stunning gown from the 1850's but now it has stains, small holes and missing silk ribbon. 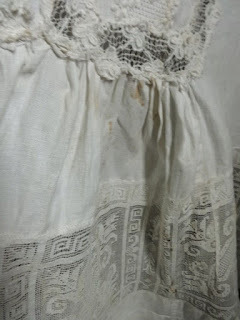 It is a reminder of another time and another place. 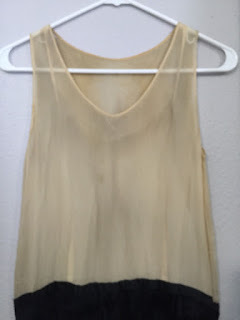 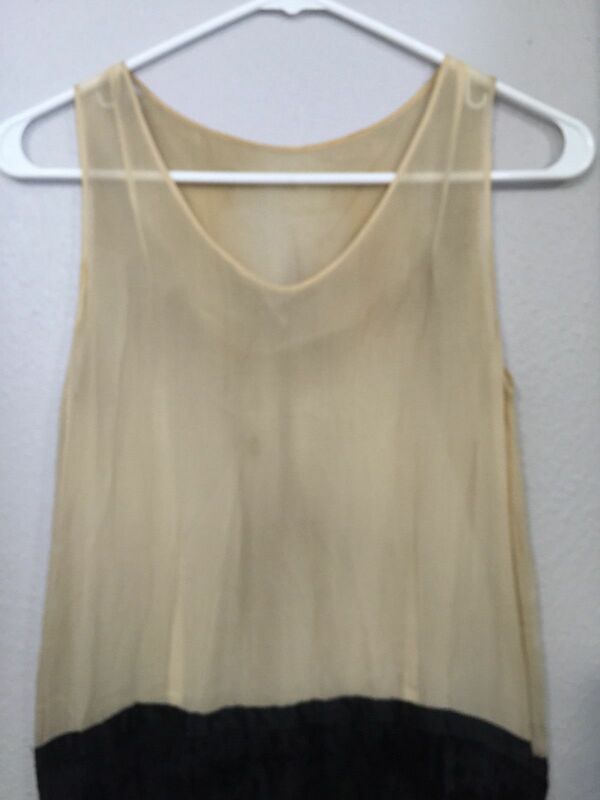 The inner layer is silk tulle. 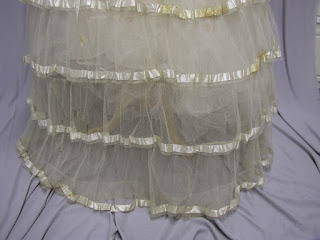 The top layer is rows of silk tulle ruffles trimmed in silk ribbon. 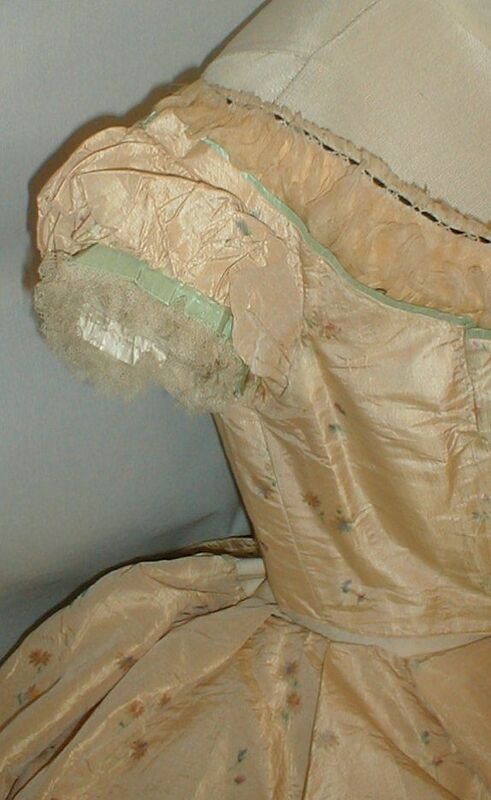 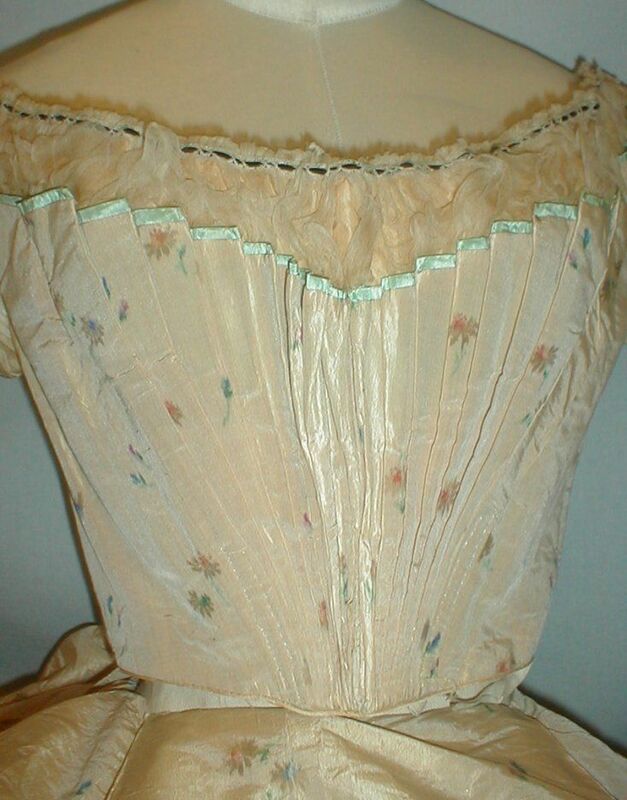 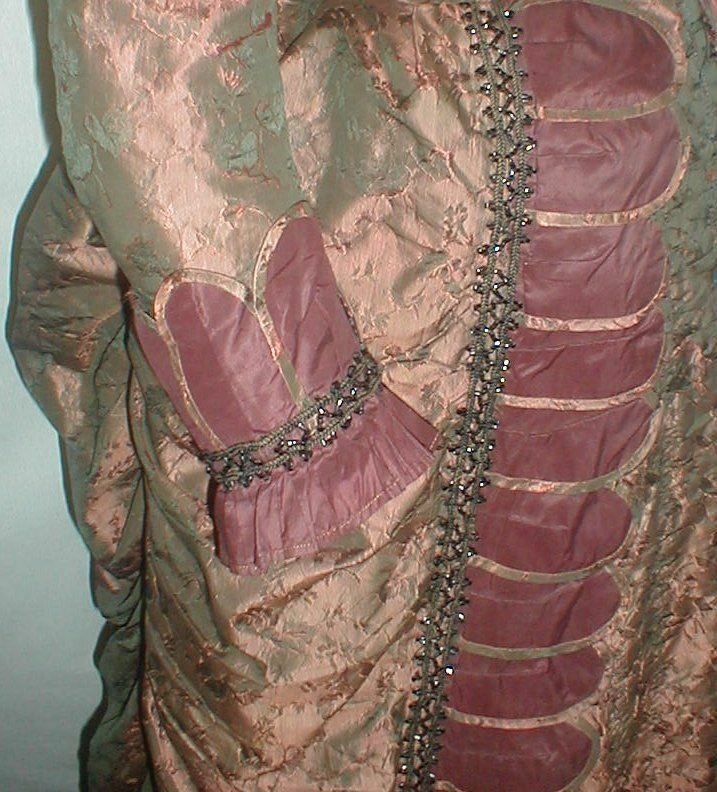 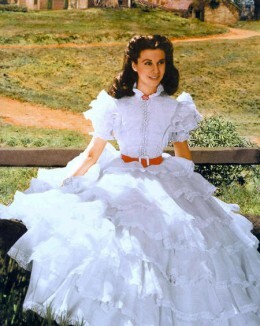 The second row of ruffles on the bodice has one piece of ribbon that is hanging in the back. 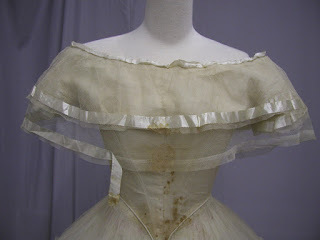 I measures it and if you were to sew it back in place there is a three inch loss of ribbon because of stains and damage. One of the photos from the back show the silk ribbon hanging from the back of the second row. 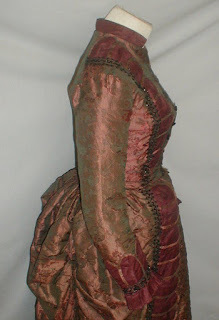 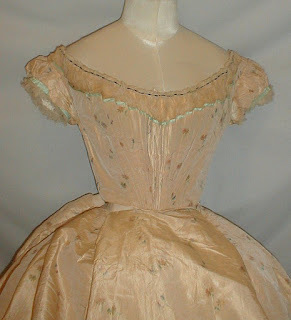 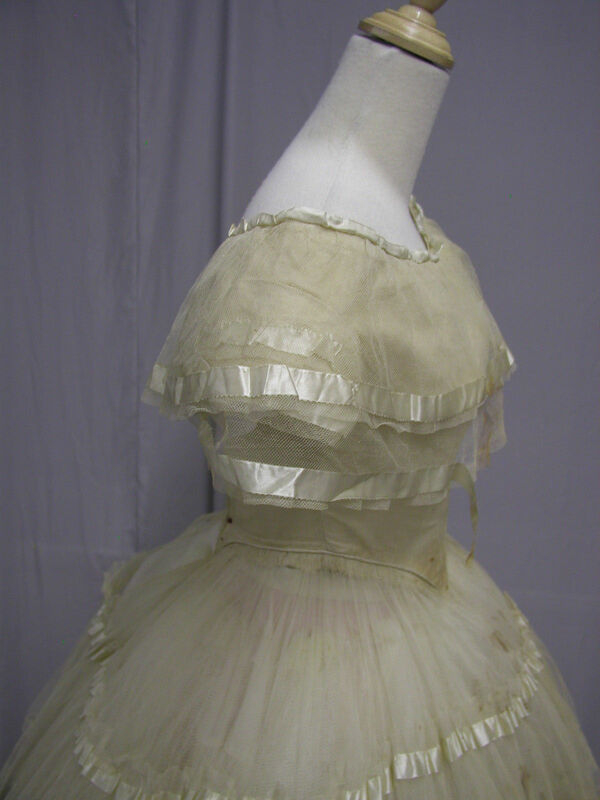 The second row of ruffles on the skirt is missing all of its silk ribbon. This woman was tiny with a bust of 29, a waist of 21 and shoulders of 13 inches. 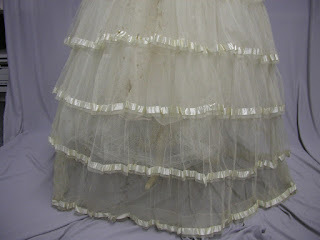 The length of the skirt is 42. 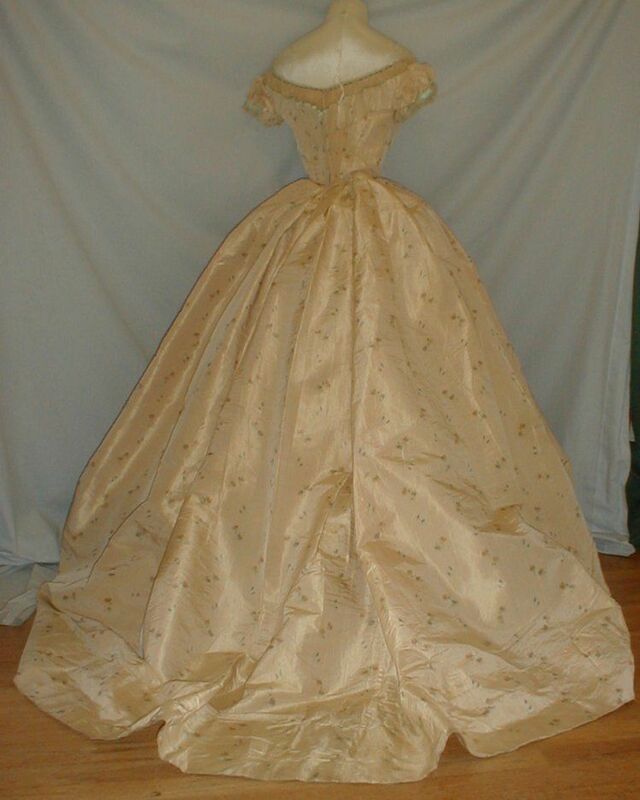 It is right at 160” circumference. This gown is being sold for its historic importance. 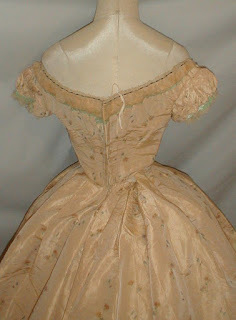 It was high fashion of its day. 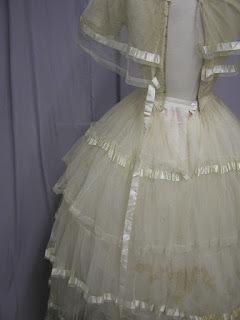 It looks like it's two separate pieces to me which means it's not Princess style - just meant to mimic that style. 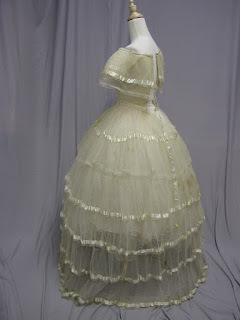 I believe this is from about 1883 - right as the Natural Form dies and the bustle comes back.